MANISH Jha first imagined a world without women after he read a report about a village in Gujarat that was inhabited only by men—the result of unchecked female infanticide. He later found a Ministry of Health and Family Welfare report estimating that 35 million females have been killed at birth or in infancy over the past century. “We talk about the decreasing tiger population, but what about the disappearance of 35 million women?” asks the 26-year-old filmmaker. His agitation fuelled his creativity. 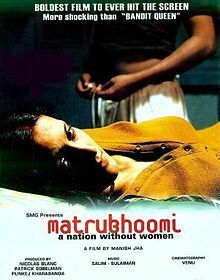 Soon after, Jha wrote the script that has become the acclaimed film Matrubhoomi: A Nation Without Women. The film, which Jha also directed, has received a mantleful of awards at film festivals, including the International Critics’ Prize in Venice. Two years after the film was completed, it is finally being released in India—though after several censor’s cuts. The film is set in a futuristic rural Bihar, where decades of killing female babies by drowning them in cauldrons of milk have eliminated women from the population. In the woman-less village depicted in the film, men copulate with cows and the elders cry in nostalgia as they watch women in pornographic films. When a 16-year-old girl, Kalki, is discovered, she is married off to five brothers, each of whom claims her for one night a week (their father gets the remaining two nights). The allusion to Draupadi’s character in the Mahabharata epic is clear, but Jha is more inspired by fact than by myth. He was made acutely aware of the cruel treatment of women when he was eight. A woman in his native village Dhamaura had been burnt by her husband because she didn’t bring in enough dowry. “I saw her lying on the ground, her body covered in 90 percent burns, completely naked because her clothes had been burnt,” Jha remembers. After he graduated with a degree in English literature three years ago, Jha came to Mumbai, but found that the big city wasn’t any more large-hearted to women, especially homeless women. His five-minute short film on homeless women, A Very Very Silent Film, was widely acclaimed at international festivals, and scooped up the jury prize at Cannes in 2002, prompting two French producers to commission him to direct a film. The script for Matrubhoomi emerged in one breathless week while working as a chef in Iceland. In that country to work as an assistant director on a film that never materialised, Jha had to earn his keep. Back in India, Matrubhoomi was wrapped up in a 28-day shoot. This article originally appeared in the June 3-16 2005 edition of TimeOut Mumbai.